A couple of days ago the lovely lady and I decided we would test out the new Cajun Heritage Cajun Blast Garlic Pepper seasoning on some tasty grilled burgers. After all, two of the five best flavor enhancers in the world are garlic and pepper. Stay tuned for the other three. The burgers were fantastic with the garlic pepper seasoning. I could have waited to do this quick review until I’d done some steaks or other items, but I wanted to give Cajun Heritage their due as soon as I sunk in my teeth. 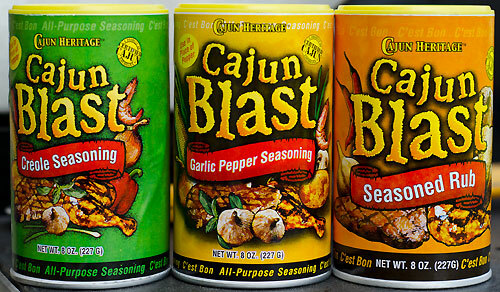 Next up will be the Cajun Blast Seasoned Rub or Creole Seasoning. Can’t wait! Here is a link to Cajun Heritage’s web site, but it isn’t designed very well. Needs to be redone.